The more I read Is It Wrong to Try to Pick Up Girls in a Dungeon? the more I truly come to appreciate the series despite the somewhat awful choice of title. Author Fujino Omori comments that the third volume of the series finishes off what he regards as the first part of the series’ story, and with that in mind I think it probably is the most fitting end you’re going to get for this section of our tale.Overall this volume isn’t quite as busy as the two previous, with less world building and a lot less character interaction and dungeon exploring going on it’s left to develop Bell and where he currently stands in this world. The first volume is spent with Bell being trained by his hero Aiz Wallenstein in the art of fighting and while not a great deal happens during the course of his training it’s still an important time for Bell as a character. It allows him to see the difference between himself and Aiz and makes his drive to close the difference between them just that much more, which of course is very important to our story. 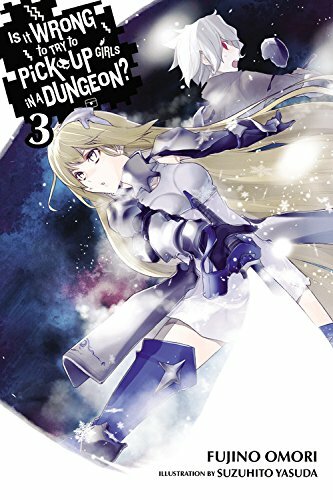 The second half of the third volume is focused on what is perhaps one of the biggest battles Bell has had so far, but also what becomes the most important for his development as he faces up against a Minotaur, the creature that almost killed him at the beginning of the first volume which Aiz saved him from. This is a messy battle and not something Bell or anyone else will look back on and call an epic fight in any shape or form, but it’s important for Bell and the fact it drew me in as much as it did (to the point of not putting the book down until I finished it), is something to be applauded overall as it’s very rare that fight scenes in light novels have caught my attention as much as this did. Right now I don’t really have a bad word to say regarding Is It Wrong to Try to Pick Up Girls in a Dungeon? as the characters are now well developed and the overarching story is coming together nicely and ultimately the series is satisfying my need for a good fantasy story. Each volume left me wanting to dive into an JRPG and go on my own adventures alike young Bell and co, and for me that’s a sign of a good story. If you draw me in enough to keep thinking about the story long after the fact and get me so excited for fantasy stories and JRPG playing, then you’re doing something right. I think what probably draws me into this series more and more as I read it is the fact Bell is pretty humble and he’s not a super powerful character right from the start. Sure, I can see that there is more than meets the eye concerning him, but Bell doesn’t see it yet and right now he has to work for everything he gains. The battle at the end of the book feels realistic, Bell is frightened and doesn’t think he can overcome this fear to defeat the Minotaur, but he also has a sense of pride and doesn’t want to be saved by Aiz again. It’s a mental struggle but one which he must overcome if he wishes to become stronger, and it’s one that is a joy to read through as I’ve never felt more connected to these characters then I do coming away from the third volume. As of volume three we’re aroundabout episode 8 of the anime adaptation which means we’ve still got a ways to go before the novels released in English finally surpass the anime. I don’t mind this too much as it turns out the anime did neglect to include a few things the novels do to set up for future stories, but I’ve also got a hunger to be past the anime and see where the story goes after that last anime episode. It’s not because I disliked the anime and this part of the story by any means, as I actually love the early part of Is It Wrong to Try to Pick Up Girls in a Dungeon? both in the novels and the anime, and at this point we’re fast approaching some of my favourite parts of the tale, but I want more. I want to exploring new stories, exploring new levels of the dungeon and meeting new characters with Bell and friends. This is a tale I never expected to fall in love with, but having now captured my heart I need to see where we go next. Is It Wrong to Try to Pick Up Girls in a Dungeon? is being published in English by YenPress. Three volumes are currently available with the fourth being released in December.